Have you ever been in one of those committees where everybody in the room had veto power over everything? I know you government types have. Governments operate more like a collection of (occasionally warring) city-states than a traditional top-down organization. This mode of operation has advantages and disadvantages. Hello, disadvantage. If you ever wondered how did our web site for the City of Bupkiss get this awful?, this is it. This comes about for the same reason you get multi-layered committees who are only referred to by their acronyms - risk aversion. In risk-averse organizations, the actual or perceived penalties of risk are greater than the rewards. Mandatory consensus mitigates risk by spreading responsibility to as wide an area as possible, because saying that everybody is responsible is another way of saying that nobody is responsible. This came up because I recently managed to rescue a project from the pitfalls of consensus. How does one with the social skills of a turnip (hi!) manage the kind of subtle manipulations required to navigate that kind of environment? Beats me. It mostly involved waiting patiently with my trap shut. I finally got somebody to voice what was on my mind and pounced, declared it manifest brilliance, and ran with it like the dickens before anybody knew what hit them. 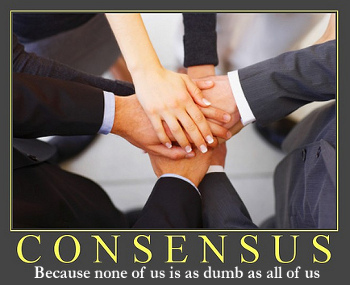 Mandatory consensus isn’t a rule problem or a strategy problem where you would form another committee (probably referred to by an acronym) to create more paper to attach as appedix F on your strategic plan which, by the way, nobody but you has read. This is a culture problem, and culture eats strategy. If it is something you plan on fixing, that is where you have to start.